William C. Ratcliff has been named the recipient of the 2018 Sigma Xi Young Faculty Award. The award recognizes outstanding research achievements by a faculty of rank no higher than assistant professor. Ratcliff is an assistant professor in the School of Biological Sciences. 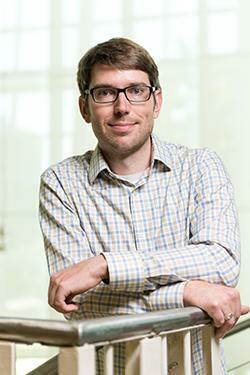 An evolutionary biologist, Ratcliff studies how organisms change over time. In particular, he wants to understand how multicellular organisms can evolve from single cells. This question remains one of the fundamental problems in biology. In a 2016 interview, Ratcliff explained his approach. “In our lab, we do evolutionary time travel in a test tube, by creating new multicellular organisms, using yeast and algae, in a way that’s simple but which we can examine with huge precision, using all the tools of biology, mathematics, and physics. We’re not trying to explain what happened historically. Rather, we’re trying to show how it can happen in principle. Ratcliff has shown that multicellularity can evolve quickly. The simple multicellular “snowflake” yeasts he has evolved in the lab – by selection for rapid settling through liquid media– possess a multicellular life cycle, reproducing through small propagules, like stem cuttings. Over 1,500 generations, they adapted to the selection pressure by growing faster and evolving a more hydrodynamic shape. They also evolved a simple division of labor, using programmed cell death to sever links between cells and produce more propagules. Experiments with a unicellular algae have yielded broadly similar results. From these observations, fundamental insights have emerged about the evolution of multicellular complexity. For example, mutations that are beneficial to the multicellular aggregate but costly to the single cell can accelerate evolution of increased multicellular complexity. In addition, his work has shown how the 3D geometry of yeast clusters allows a rudimentary form of development to arise, guiding the emergence of new multicellular traits from mutations that only directly affect the properties of single cells. Taken together, Ratcliff’s research upends conventional wisdom that the transition to multicellularity must have been slow and difficult and must have required extraordinary conditions.